Unleash the power of the crowd funding platform. 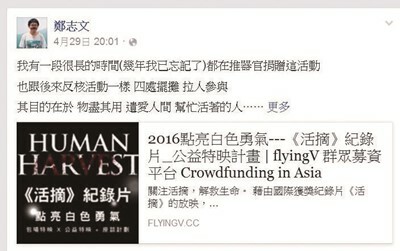 Fund-raising program on FlyingV succeeded. 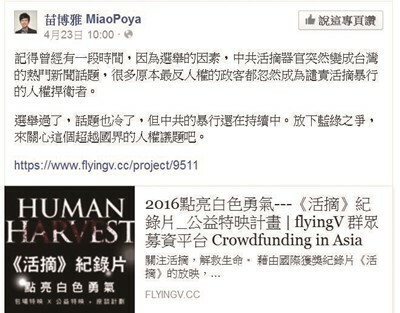 Numerous patients can only choose organ trading in China just to elongate their life without knowing that this may be a deal with the devil, the origin of a life long ethical dilemma, and underlies more unaccountable risks…” Such description about illegal organ trafficking appeared on FlyingVs facebook page. The Peabody Award winning documentary “Human Harvest” spent eight years gathering evidence, and made many viewers come forward and help prisoners of conscious including Falun Gong practitioners, Uighurs, underground Christians, and more. Three Taiwanese patients spoke about their personal encounters, stimulating people’s empathy. We thank all the sponsors and supporters of this fund-raising project, your comments have encouraged us to go more for this society. People can see related information at tourist attractions in Taiwan and around the world. Yet personally I would like to know more about this topic from this documentary, since we know very little about it even we see it all the time. I have been engaged in promotion of organ donation for a very long time, for the purpose of making the best use of resources and helping those who are in need, but these are all voluntary. On the contrary, China is performing forced organ harvesting. Taiwanese patients and patients from others countries are flocking towards China for organ transplants, the organ sources are mind-boggling. It is hard to imagine that there is such a brutal government, continuously persecuting it own citizens. Caring for human rights in China can also protect Taiwanese people in cross-straight interactions. 2016 lightening the white courage “Human Harvest” documentary screening program, if you have time and is interested, people give it a click , thank you. There was a time, for the sake of elections, CCP forced organ harvesting became a hot topic in Taiwan, even the most anti-human rights politicians became the defender of human rights and condemned the act. After the election, the topic faded out, yet the atrocity continues. Please set your political oppositions aside and show some empathy to this international human rights issue. “Oh, they took my freaking kidney!” Do you remember this famous line from Charlie the unicorn? In real life, organ transplantation is a serious topic that you have to concern. Taiwan Association of International Care for Organ Transplants launched a crowd-funding project, trying to show the true face of overseas organ transplants through a documentary, letting people understand the dilemma of the transplant community.